Sherman Robertson will be in the UK and Europe from July 22nd - end of August 2011. Sherman and the band are now confirmed for the Great British RnB Festival, the Rhythm Festival and the Belfast Blues Festival. "Sherman Robertson and BluesMove is a mighty powerful combination." Blues Matters! Sherman Robertson is already considered a young master of zydeco, hard-swinging Texas electric blues, R&B and swampy Louisiana blues. Robertson often surprises audiences with his ability to play R&B, zydeco and blues with a rock edge. "I use that driving, road-cooking type zydeco groove, and put blues on top of it," says Robertson. It's basically rhythm and feel." In June 2000, Robertson played at the Pioneer Valley Blues Festival in Massachusetts. Alligator president, Bruce Iglauer, was in the crowd. "He was always good,� he says, "but when I saw him in June he was on fire. He ruled the stage, had the audience in the palm of his hand, and his just plain physical showmanship reminded me of Albert Collins. As Soon as he walked of the stage I started talking about signing him. He's got that Texas energy, great guitar chops, and is a wonderful, soulful singer." Sherman was born in Beaux Bridge, Louisiana and raised in Houston, Texas. Robertson quickly earned a local reputation as a very good guitarist. While still in high school Robertson was recruited by his music teacher, Conrad Johnson, to play in his popular group, Connie's Combo (and otherwise adult band). As a teenager in the late 1960's, he spent six weeks on the road as lead guitarist with blues superstar Bobby "Blue" Bland and also backed Junior Parker. That gave Sherman the incentive to form his own band, Sherman Robertson and the Crosstown Blues Band with whom he recorded two albums on the Lunar II label. During the 1970's, Robertson was content playing weekends while raising a family and holding down a "regular" job until Clifton Chenier, " the King Of Zydeco," asked him to do some dates with his band. Those few dates turned into 5 years, as Robertson toured Europe and U.S. with Chenier. He then joined Terrance Simien's hot, then young zydeco band, briefly playing with Rockin' Dopsie, Johnny Clyde Copeland and several other well-known artists. The word on Robertson's talent began to spread. Paul Simon needed a guitar player to add some sounds to his Graceland album and he chose Robertson. Soon after, legendary British producer Mike Vernon (John Mayall's Bluebreakers with Eric Clapton, Freddie King, Fleetwood Mac, David Bowie) signed Robertson to Atlantic Records. Robertson's first solo recording, 1993's I'm The Man (Atlantic1994), was nominated for a W.C. Handy Award. His second Atlantic release, Here And Now, was released in 1996 to more critical acclaim. But convinced he would have more promotional support and artistic freedom from an independent label, Robertson weighed his options. In early 1998, producer Joe Harley, with the help of Robertson's manager, Catherine Bauer, assembled a first class back up band for a project for the AudioQuest label, including two charter members of Little Feat, keyboardist Bill Payne and drummer Richie Hayward. They all gathered at Ocean Way Recording in Hollywood for the sessions that resorted in the album, Going Back Home. Blues Revue loved the release. " Potent singing and sizzling guitar�Robertson is unstoppable." 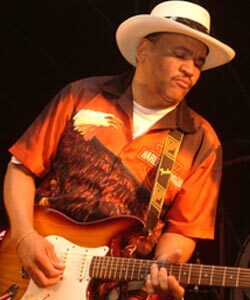 JUST ANNOUNCED Movinmusic is pleased to confirm that it is now working on Sherman Robertson Band dates during June 2012. Interested venue owners/promoters can contact us about his availability via e-mail or 0044 (0)1209 860067.